Step 364. Knowledge Carries Me Because I Am A Student Of Knowledge. As you carry Knowledge, you will feel Knowledge carrying you. You will feel Knowledge guiding you and directing you, preserving you, protecting you from harm, keeping you from difficult and harmful engagements, engaging you with individuals with whom you must be engaged and leading you away from divisive engagements which do not have purpose. Thus it is that you become a leader and a follower, for you follow Knowledge and you lead yourself. You yield to Knowledge, yet you exercise the power of decision upon your own behalf. Thus it is that you become a great follower and a great leader. Thus, you are in a position to serve, and you will increasingly feel as if Knowledge were carrying you through life. And you will feel that you are carrying Knowledge as well. Seen correctly, you will realize your true relationship to Knowledge. You will realize that you carry Knowledge within you and that Knowledge carries your well-being within itself. This is perfectly complementary. It is perfect because it is born of perfection itself. Be a true student of Knowledge. Engage yourself in practice. Give yourself in practice. Do not alter your practice. Do not neglect your practice. All you need to do is practice and be attentive, practice and be attentive. Upon the hour and in your two deeper meditation practices, where you come into stillness to be with stillness itself, practice to practice, practice to learn and learn to learn. Today you are learning to learn. 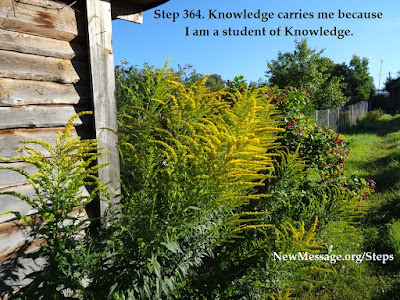 Today you are a student of Knowledge. Practice 364: Two 30-minute practice periods. Hourly practice. June 20, 2014 Round One: This requires constant practice and application, dedication and devotion, it does not happen in one fell swoop, it is gradual, incremental, sometimes imperceptible, until it comes to fruition. I have an idea, something I want to bring to fruition, I feel as though Knowledge is carrying me, that I am following Knowledge and leading myself, making decisions. However, it takes time to see the end result and there may be corrections and adjustments along the way. I wish to always keep my mind alert to where Knowledge is taking me, to know who to engage with, what circumstances to become involved with, where to apply myself, how to participate. And I do feel protected. This is only the beginning. The journey, the knowing, the reclamation of Knowledge goes on. This is what I am striving to do. I am glad I am not stressing about work anymore. I am just doing what I can every day and enjoying Greg’s visit. The best part is getting out to jog and swim every morning. That energizes me for the whole day. Claire is reaching out again. That makes me very happy. My overwhelming feeling today is that all is flowing as it should, things are in perfect order, and I am going with the flow, being buoyed along by Knowledge. This is the only way. I just have to add this P.S. "We yearn for a place of acceptance and loving care, a place where we can simply be. "My question today is this: am I such a place for my loved ones, my friends, the people who cross my path? Do I give them a safe place to fall, a haven from the storm? Am I that sweet smelling flower calling them home or do I have sharp spiky words that cut through their souls, tearing them apart? Do I provide them with nourishment or do I poison them with criticism and negativity? Am I a gentle green meadow with a softly flowing river where weary travelers can find a moment's rest? Or am I a cactus, prickly and quick to be hurtful?" I can only hope that for my children, coming to visit Sasha and me in Krasnaya Ushna is like coming to that safe haven where they can rest and recuperate, a safe place for them to fall.